Eight in 10 Americans (81%) report that businesses are meeting or exceeding their expectations for customer service, compared to 67 percent in 2014. 40 percent of Americans say businesses have increased their focus and attention on customer service, a significant increase in just three years (up from 29% in 2014). Globally, 54% of consumers say they have higher expectations for customer service today than they had one year ago. This number jumps to 66% for the 18–34-year-olds surveyed. According to 67% of global respondents, customer service as a whole is getting better. 52% of people around the globe believe that companies need to take action on feedback provided by their customers. In 2017, 64 percent of Americans stated that they contacted customer service for any reason in the past month. 75% of brands report that they are measuring customer engagement, but cannot define what it is. 46% of global contact center decision makers project their contact centers to grow 5% to 10% (as measured by number of agent seats) in the next year and 14% project growth of more than 10%. That’s because a superior experience earns stronger loyalty, turning customers into promoters with a lifetime value 6 to 14 times that of detractors. – Bain: Are you experienced? 67% customers feel that engagement levels have gone up in the last 2 years, as compared to previous years. Across the globe, 96% of consumers say customer service is an important factor in their choice of loyalty to a brand. A whopping 72% of consumers expect agents to already know who they are, what they’ve purchased and have insight into their previous engagements when contacting customer service. 77% of customers have a more favourable view of brands that proactively invite and accept customer feedback. 33% of customers who abandoned a business relationship last year did so because personalization was lacking. 34% of companies are undertaken Customer Journey Mapping (CJM) into their customer service. Two-thirds of customers are willing to share personal information with companies, only in exchange for some perceived value. – Accenture, Digital Trust in the IoT Era, 2015. 70% of consumers say they have already made a choice to support a company that delivers great customer service. 68% of customers believe the key to great customer service is a polite customer service representative. Service insight and knowledge is also key to a good experience according to 62% of consumers. Americans will pay 17% more to do business with firms with great reputations when it comes to customer service. More have read positive reviews (69%) of customer service online than negative reviews (63%). The vast majority of participants who have seen reviews claimed that that information did impact their buying decisions. This was true of both positive reviews (90%) as well as negative reviews (86%). 30% of those polled say the most important aspect of a good customer service experience is speaking with a knowledgeable and friendly agent. Globally, companies respond to customer service questions 85% of the time. Across a wide range of businesses, customers generate increasing profits each year they stay with a company. In financial services, for example, a 5% increase in customer retention produces more than a 25% increase in profit. Companies that excel at the customer experience grow revenues 4% to 8% above their market. Friendly employees or customer service representatives are what make a memorable experience that causes consumers to stick with a brand, for 73% of customers. More than half of Americans have scrapped a planned purchase or transaction because of bad service, and 33 percent say they’ll consider switching companies after just a single instance of poor service. The majority of Americans have decided to not go through with a purchase because of a poor customer service experience. – statista: From your experience, what has been the one most common cause of your customer service frustration? 91% of unhappy customers who are non-complainers simply leave without complaining. 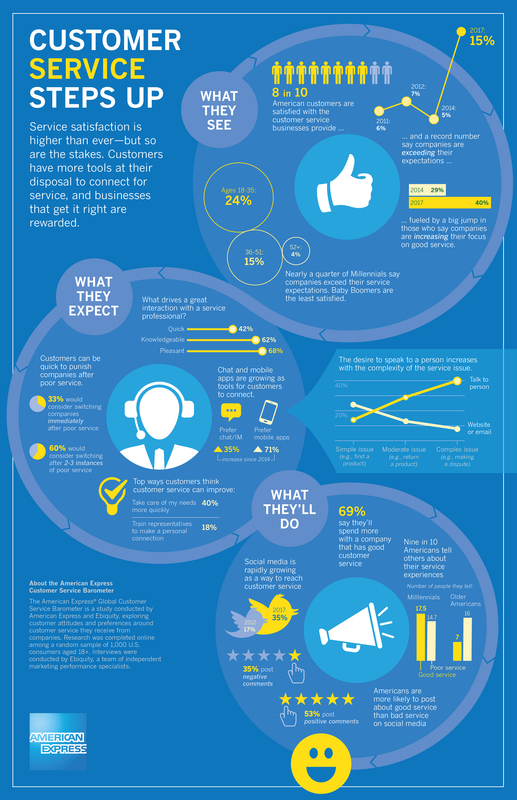 44% of customers confirm that they have received the wrong answer from a customer service representative in the past. 56% of global respondents have stopped doing business with a brand due to a poor customer service experience and 47% of those respondents say they have made the choice to switch to a different brand due to bad customer service within the last year. 39% of customers will continue to avoid vendors two or more years after a bad customer service experience. Four out of ten consumers will recommend others not frequent a business if they have had poor customer service from them. According to a report published by the Institute of Customer Service, consumers today face significantly fewer problems when buying goods and services than they did five years ago, but they are more inclined to complain when things go wrong. 84% of millennials say that businesses are meeting or exceeding their service expectations, significantly more than older Americans (79%). Millennials willing to spend 21% more to do business with companies who excel at customer service. Millennials are the only demographic of Americans who tell more people when they have a good customer service experience rather than a bad one. 63% of millenials begin their customer service interactions online. 74% of millennials say social media responsiveness improves their perception of a brand. One in two millennials has complained about a brand on social media. 43% for millennials use their mobile devices to initiate customer service engagements. 66% of 18 – 34 year-olds say their customer service expectations have risen in the last year. 31% of customers report reaching out to a company via Twitter. 29% global companies prefer mobile devices to computers. 88% of consumers are influenced by online customer service reviews when making a buying decision. 86% of millennials say they are influenced by negative reviews when purchasing a product or service. 33% of customers have contacted a company using Facebook and similar social channels. Nearly 1/3 of customers report sending a mobile/SMS message to the company requesting assistance. 68% of customers have a more favourable view of brands that offer or contact them with proactive customer service notifications. 79% of millennial respondents have a more favourable view of brands that offer a mobile-responsive customer support portal. 90% of our respondents say they expect brands and organisations to offer an online portal for self-service. Out of all customer service engagements around the world in 2017, 52% began online. 66% of global respondents say they actively use 3 or more different communication channels to contact customer service. One-third of all customers use their mobile device to initiate contact with customer service. Globally, only 5% of customer service interactions begin with a face to face meeting. 74% of Americans have used the landline to contact customer service. 48% of consumers expect a response to social media questions and complaints within 24 hours. 33% of consumers in the United States do not expect a response when asking a question of a company’s social media. Both in the United States and world wide, 18% of customers expect a response from a company’s social media within one hour. – statista: What is your expected response time for social media questions or complaints? 35 percent reported reaching out in social channels, up significantly from the 2014 survey (23%) and double the percentage from 2012 (17%). 55% of people age 18-34 have praised a brand or its customer service over social media. 33% of people aged 18-34 have contacted a company’s customer service via social media. Of the Americans who have sent customer service requests over social media, 84% report receiving a response from the company. It’s estimated that by 2020, 85% of interaction between a customer and an organisation will be without interacting with a human. More than six in 10 U.S. consumers say that their go-to channel for simple inquiries is a digital self-serve tool such as a website (24%), mobile app (14%), voice response system (13%) or online chat (12%). 30% of US consumers rate chatbot interactions as “very effective” in dealing with customer service issues. Over half of consumers say that the main reason they cannot resolve an issue on their own is because there is too little information online. 30% of consumers say not being able to reach a real human is the most frustrating part of a bad customer service experience. 77% of consumers report having used a self-service support portal. Only 12% of Americans say they cannot find the information they need in self-service portals. 37% of customers report using an online virtual agent or chatbot from a website, and nearly that many have used a virtual agent or chatbot on a smartphone. Your customer doesn’t care how much you know until they know how much you care. ~ Damon Richards, Customer Service Expert. “Loyal customers, they don’t just come back, they don’t simply recommend you, they insist that their friends do business with you.” — Chip Bell, Author of Take Their Breath Away: How Imaginative Service Creates Devoted Customers. “You’ll never have a product or price advantage again. They can be easily duplicated, but a strong customer service culture can’t be copied.” — Jerry Fritz, Author of Breakthrough Customer Service. Despite all the growth and change in the customer service realm, the golden rule still reigns supreme. The customer is always right, even when they are wrong. Most research shows it’s just as important to treat the customer with respect and courtesy as it is to fix the problem. It’s likely the industry will always need to have friendly staff available to add that human touch. On the other side of the coin, amazing technologies are emerging that are changing the dynamics of customer service, such as social media for customer service, self-service portals and customer journey mapping will help firms deliver the best experience possible. Finding the balance between efficiency and politeness may be the key to customer retention. statista: From your experience, what has been the one most common cause of your customer service frustration? statista: What is your expected response time for social media questions or complaints? Previous Previous post: [Solved] How Do I Fix Surface Book 2 Battery Drain Quickly Issue? Next Next post: How Do I Improve Better SEO Ranking in 2019?